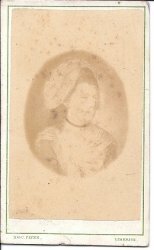 Carte-de-visite size, c.6 x 10cm, faded photograph of Bridget Winthrop (or engraving of), sl. spotted, on reverse the following information in MS., Bridget Winthrop married to Wm Maunsell | Mrs Wm Maunsell gt grandmother of H.O. Donnell[MA CLK?] 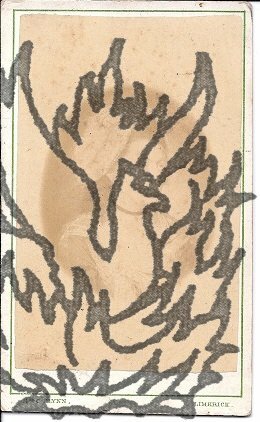 [space] great great Grandmother to Mrs Petronella O'Donnell and to Mr Elliot O'Donnell". [Printed on reverse: Mrs. C. Flynn | Bookseller & Stationer | Circulating Library | Photographic Studio | 20 George Street | Limerick".From the archive of Elliot O'Donnell, Irish ghost-hunter. Note: Limerick: Mrs. C. Flynn, 40, Great George's-street, one of the publishers of "The Celt" (periodical, c.1857). Unusual in being a female bookseller and involved in the new art of photography, I have found no other information about her yet. Image available by request or on my website).